A alternate method for a simple way to use a true, with the primary bartype full syncronized, MultiSymbolChart. The time scale is not changed and only based on the primary instrument / bartype. With the syncronized ticks for the additional symbol i create and draw a candle chart. - For any not timebased bartypes this method work right and better in compare to the default MultiSymbolChart of NT7! 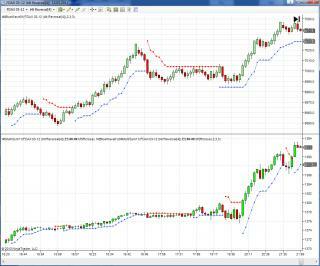 - The indicator can work with any (intraday) bartypes and give the best results with tickbased calculated bartypes. - For time based charts (sec/min) please use as t4tBetterBars, t4tMagicBars or a other bar type with true non future time stamps and tickbased calculations. - simple and secure instrument selection over a standard combobox/dropdown list prefilled with all NT7 symbols. Please use a PM or the t4tCum thread for any questions. This indicator is intended for TRUE ELITE users at BMT. PLEASE DO NOT STEAL AND SELL TO OTHERS, YOU KNOW WHO YOU ARE (and we know too!). Excellent. Extremely valuable real life trading tool.